AIPAC lobbyists gathered outside Rep. Madeleine Dean’s office, March 28, 2019. Photo: Rep. Madeleine Dean via Facebook. FOR THE PAST FEW WEEKS, Washington has been arguing over whether the American Israel Public Affairs Committee (AIPAC) uses money to influence Congress. The reality I saw at AIPAC’s annual policy conference last week was even more striking: the organization recruits politicians to act as its lobbyists. Everyone present—AIPAC staffers, think tank officials, war profiteers, lawmakers, students—was on the same page. There were no dissenting voices. The same messages were hammered home over and over, echoing specific talking points provided to every conference-goer, and intended to be repeated on attendees’ visits to Capitol Hill. In the lead-up to the event, multiple US politicians excoriated freshman Rep. Ilhan Omar for saying that Israel supporters push “allegiance to a foreign country,” after getting her to apologize for suggesting AIPAC buys influence in Congress. At the event itself, a bipartisan parade of senior lawmakers stood before AIPAC members to attack and misrepresent Omar once again, even as they plainly embodied her assertions by pledging their unconditional support for Israel and touting their work to protect the country’s interests in Washington. On the first night of the conference, Democratic House Majority Leader Steny Hoyer pandered directly to the crowd with the reddest of meat: “When someone accuses American supporters of dual loyalty, I say ‘accuse me.’” Similar critical references to Omar were made by subsequent speakers ranging from Vice President Mike Pence to Democratic Senate Minority Leader Chuck Schumer, always to raucous applause. With 18,000 attendees, the sprawling Walter E. Washington Convention Center was packed. AIPAC gave attendees color-coded lanyards based on how much they donate to the group annually, which enabled a shocking number of people to flaunt their wealth with lanyards indicating they give $3,600, $10,000, or more. Those numbers don’t even include direct contributions to political campaigns. AIPAC raised $108 million between October 2016 and September 2017, according to its most recent tax return. Its charitable arm, which funds lawmakers’ visits to Israel, took in $65 million during that same time. In 2018, AIPAC disclosed spending more than $3.5 million on lobbying. But the organization’s real power comes from converting its donors and student supporters into grassroots lobbyists. Attendees were directed to promote a few primary agenda items in their meetings on the Hill, including increased US security assistance and foreign aid to Israel as well as legislation to condemn the Boycott, Divestment, and Sanctions (BDS) movement. Lowey also gave special thanks to the many students present at the conference. “What’s happening on college campuses worries me even more than what’s happening in Congress,” she noted, referring to rising criticism of Israel from BDS activists and others on the left. The prevalence of Israel critics at universities was one of the dominant themes of the conference. A session on “Responding to Israel’s Critics” was not so much about engaging detractors of Zionism directly—indeed, the moderator recommended that audience members avoid talking with any of the protestors outside the conference—but about how parents can help teach their kids to respond to anti-Israel sentiments when they get to college. One older woman in the audience choked up as she asked the panelists how she should react to her “wonderful” 20-year-old grandson, who attended AIPAC with her two years ago, deciding in college to support J Street, a center-left political group that advocates for a peaceful, two-state solution to the Israel/Palestine conflict. Cardin agreed, adding that he wanted to protect American companies. “If you allowed the BDS movement to move forward, American companies would be intimidated if they do business with Israel,” he said. On Tuesday afternoon, shortly after the conference programming ended, the narrow hallways of the Hill’s House office buildings were teeming with AIPAC lanyards and badges. 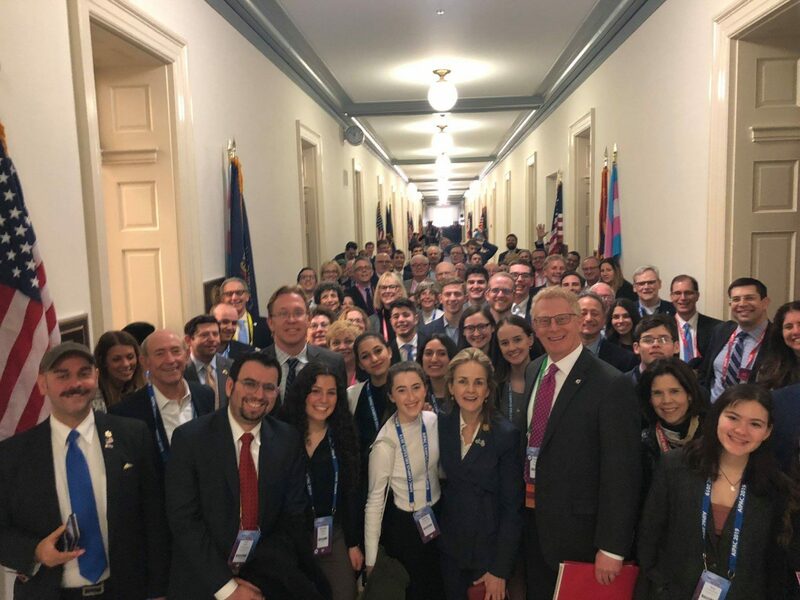 A few dozen AIPAC donors and students filled the hallway outside the office of Rep. Madeleine Dean, a freshman Democrat who represents Philadelphia’s northwest suburbs. Dean met the crowd in the hallway. It was a perfect demonstration of AIPAC’s power. Although the congresswoman had only been in office three months, she knew exactly what they wanted to hear. Andrew Perez is a senior reporter for MapLight. His work has appeared in the International Business Times and the Huffington Post.